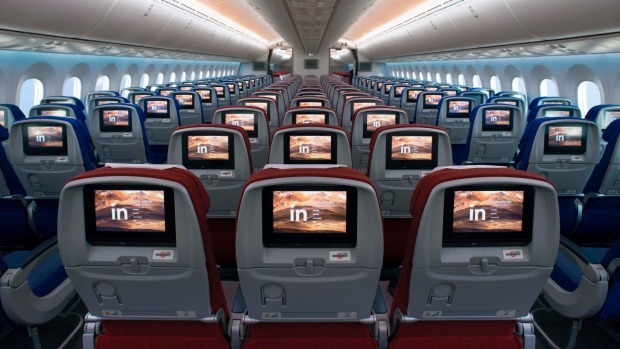 The entertainment screen might actually be better in economy than in business. We left 50 minutes late at 1.15am but made up most of the time to land just 10 minutes late in Auckland. The scheduled flight takes 12 hours, 55 minutes Santiago-Auckland and 3 hours, 40 minutes Auckland-Sydney. LATAM also offers direct Santiago-Sydney flights as codeshare with Qantas in a Boeing 747 (14 hours, 20 minutes) departing early afternoon. The bulkhead location makes the seat seem reasonably generous; it is 17.3-inches (44 centimetres) wide with a 34-inch (86 centimetre) pitch as an economy Space+ seat. The standard pitch in economy is 32-inches (81 centimetres). All seats have power outlets and USB ports. Two pieces up to 23 kilograms each, but there are limits on dimensions (I had a ski bag that went beyond the allowable 158 centimetres, but they kindly let it through). My bulkhead seats put me in to LATAM's Space+ zone; it isn't a premium economy equivalent, it's simply some extra inches of seat pitch with some seats in a better location in the cabin. Service, food and entertainment are the same as economy. 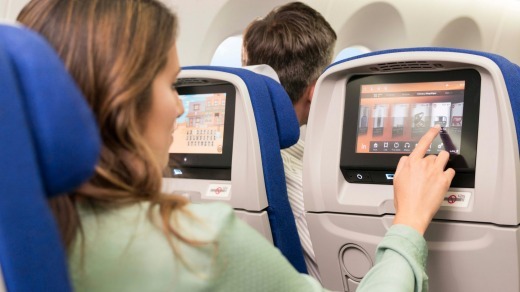 I flew business class on the outbound run and for my eyesight, although smaller, the screen in economy was actually better (closer and, being in a bulkhead seat, more adjustable). LATAM has an excellent selection of current-release and classic movies and documentaries and TV series. Attentive and efficient; maybe a late-night flight is easier to service, but, be that as it may, the drinks and dinner service was prompt and any follow-up was fast and friendly. Dinner was good, with three options on the menu: cheese ravioli or grilled salmon or, my choice, a cold roast chicken plate that came with a mixed salad with yoghurt dressing as well as some quinoa bites and fava beans. I had a chardonnay to go with it and even if it was a bit warm, it still had a good flavour about it. Breakfast was a highlight – fresh fruit and a lightish crepe, also filled with fruit. There was a snack and coffee on the Auckland-Sydney leg. Twice during the night flight on the way to Auckland, the crew had to deal with "medical emergencies". My location near the galley had them attending to the unfortunate passengers almost at my feet and I couldn't fault the care, concern and confidence the crew showed. When it went beyond their first-aid training, they called for a doctor and found one in economy nearby who managed to sort things out – both patients walked off the plane in Auckland. I noticed the doctor and his companion heading to the business class cabin on the Auckland to Sydney leg; I couldn't fault that either. A mostly-relaxed flight through the night, made better with a bulkhead seat, but if you're paying extra for one of LATAM's Space+ seats on their 787-9 and you have the option, the row 12 bulkhead seats are much better than those in row 30. Space+ seats can be paid for at the time of reservation or bid for closer to departure.